Uses: The oil helps in maintaining a level emotional state. This oil is widely used in perfume formulations. The plant is native to tropical and subtropical Asia. There are 30 known species in India. Ginger Lily is also found in regions of North America and Europe. 'Hedychium' is quite common in Brazil where it is considered as an aggressive weed. The plant is best harvested in midsummer and late summer. Older stems are removed during pruning. The soil should be kept moist with partial to full sun. 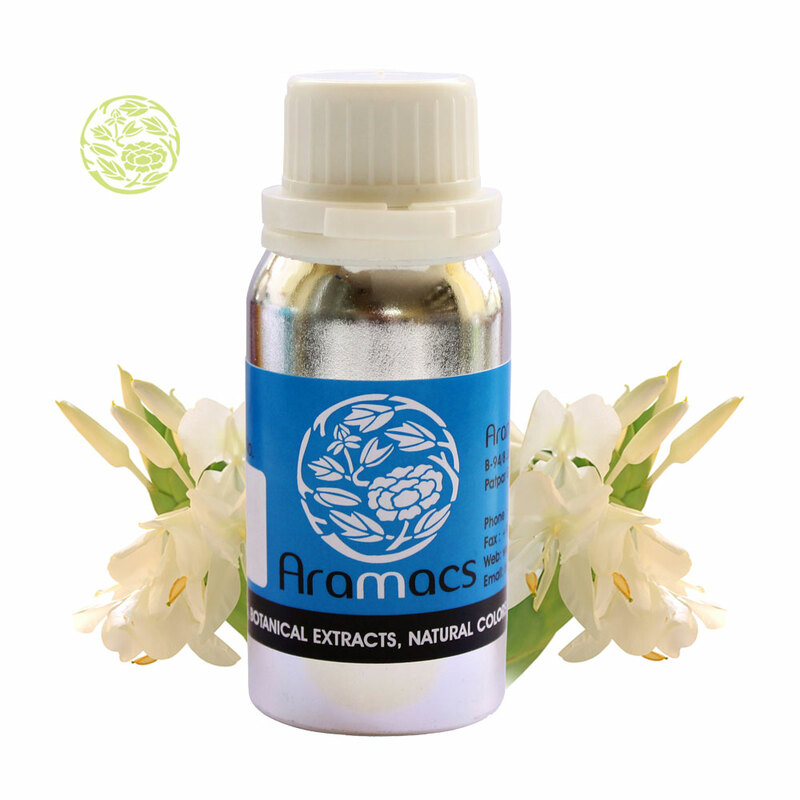 The oil has been used in both medicine and aromatherapy by ancient Greeks. The term Hedychium is derived from two Greek terms "Hedys" and "Chios" meaning flowering plant. This perennial plant grows up to 6 feet with leaves measuring about 30 centimeters. One of its species is recognized as Cuba's national flower 'Flor De Mariposa'. The oil is extracted from the rhizomes by steam or Co2 distillation. The oil is pale yellow viscous liquid warm, slightly light and spicy smell. The oil was used by Hawaiians to treat foetid nostrils. The oil is beneficial in local inflammations, asthma, boils, bronchitis, nausea, pain and in hiccups. Ginger Lily oil acts efficiently against liver complaints and in cases of diarrhea and stomach upsets. The essential oil has tranquilizing and anthelmintic properties. It fights bad mouth taste and smell. The oil acts as a vasodilator, digestive, and stomachic. The essential oil Ginger Lily is used in the treatment of vomiting, halitosis, and diminished appetite. Common uses of the oil include treating motion sickness, blood pressure, and joint pains. The oil is used in treating interior injuries. The essential oil along with powdered rhizomes is used as an antiseptic and as a poultice for muscle spasms and various aches. Ginger Lily oil is also helpful in food indigestion and poor blood circulation during blood clot. The oil is carminative, expectorant, stimulant, tonic, and emmenagogue. It also treats conditions such as stress, migraines, frozen shoulders, nervous exhaustion, strains, and accidental injuries. The oil has both anit0bacterial and anti-viral properties that acts effectively against gram positive bacteria and fungi. 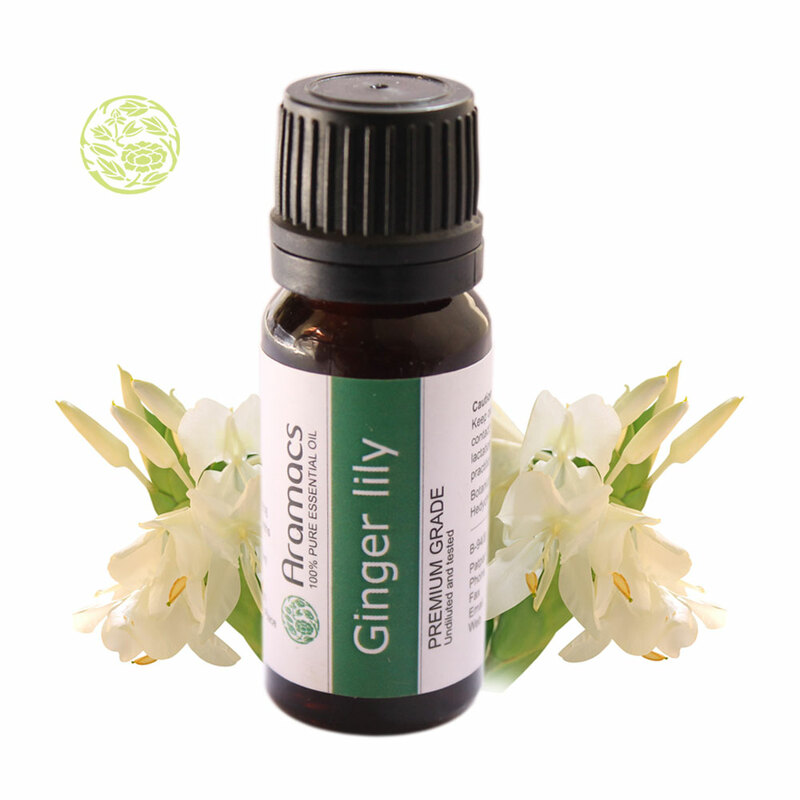 Ginger Lily oil also boosts the immune system, stimulates hormones, stimulates energy, and induces relation. The oil is used in perfume formulations. It is also used in hair oil to prevent hair fall and baldness. Due to its warming sensation, the oil is used in massages. It is used in seasoning meals and for creating ginger essential oil. The FDA has approved the use of Ginger Lily oil. The oil is a good skin moisturizer that leaves the skin rejuvenated and smooth. 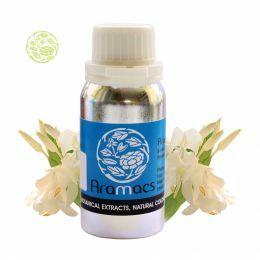 Its smell is really superb and without any doubt it’s the best smelling oil, earthy, mild ginger like, hot notes after sweet, that you will ever find. The subtle, clean aroma of this oil will impress the house mates.